After one of the wettest summers on record, many gardeners and growers have seen their vegetable patches decimated by all the pests that the wet weather has encouraged. However, for one group of enterprising dinosaur enthusiasts hungry birds have been put off their greens thanks to the employment of a Tyrannnosaurus rex model that has turned out to be a highly effective scarecrow. 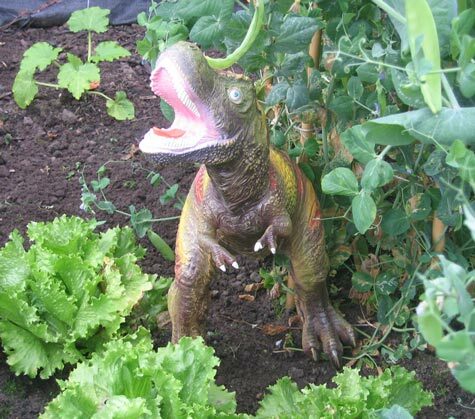 The gardener-friendly T. rex stands nearly three feet tall and once team members at Cheshire-based Everything Dinosaur placed the fearsome predator in their vegetable plot, attacks from pigeons stopped and the staff were able to enjoy growing crops of lettuce as well as peas. The large, plastic dinosaur model, nicknamed “goggle eyes” as his eyes move; was placed in the middle of the vegetable patch in desperation after repeated attacks from pigeons had wiped out all the lettuce seedlings that team members had planted. The pigeons seem to have taken an instant dislike to the dinosaur and have kept away ever since. Team members move the model dinosaur around the vegetable beds every few days, just to keep the pigeons “on their toes” and this unusual Tyrannosaur tactic seems to have worked as staff at the Cheshire based company tuck into lettuces, peas and beetroot with a bumper crop of onions and courgettes likely to follow. 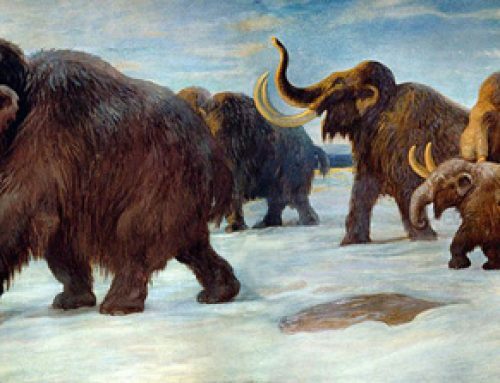 For one group of vegetable growers thanks to the intervention of the Tyrant Lizard King it seems that their crop of lettuces will not be going extinct.